Update on progress and planned work up to the Christmas break. The flushing bells which will clean the tank when it drains down were delivered and installed this week. The central support column is now complete and the cover beams and slabs will be brought to site for construction W/C 4 December. 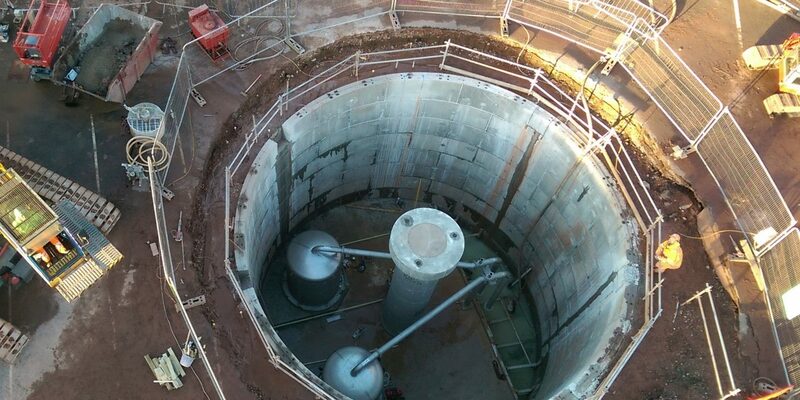 We will start core drilling the tank to take the associated pipework around 6 December and we hope to be moving the large crane from the site on Wednesday 13 December. Obviously tracking the crane through the village may cause some delays to traffic and we will update the parking restriction signs when the date is confirmed. In the run up to the Christmas break we will start the ground works for the necessary pipework to connect the tanks and the sewers. The site will be closed over the Christmas and New Year period, we will return to work on 2 January next year. Please contact me if you have any questions or comments about this work.